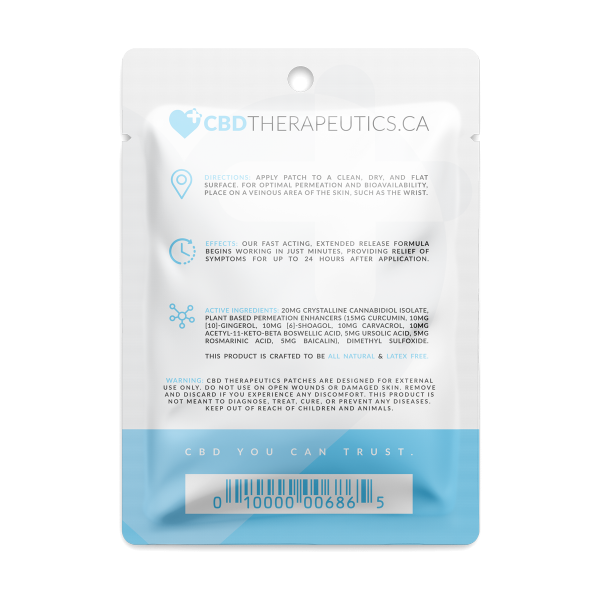 CBD Therapeutics 20mg Extended-Release Transdermal Patches are produced using our Co2 extracted CBD Isolate Formula. Each patch is individually packaged in a specially designed, hermetically sealed pouch with convenient dual tear notches. Directions: Apply Patch to a clean, dry and flat surface. For optimal permeation and bioavailability, place on a veinous area of the skin, such as the wrist. All Natural & Latex Free! 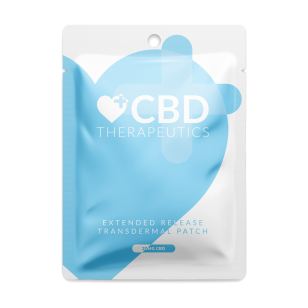 CBD Transdermal Patch (20mg per patch) 8-Pack Each patch lasts for 24 HOURS with an Extended release formulation CBD Therapeutics 20mg Extended-Release Transdermal Patches are produced using our Co2 extracted CBD Isolate Formula. Each patch is individually packaged in a specially designed, hermetically sealed pouch with convenient dual tear notches. Directions: Apply Patch to a clean, dry and flat surface. For optimal permeation and bioavailability, place on a veinous area of the skin, such as the wrist. All Natural & Latex Free!